Galileo Galilei was, in many ways, the founding father of modern science. He was one of the first people to insist that you needed to both know theory and experiment to confirm that theory. He, famously, refined and popularized the telescope and wrote a treatise on motion that inspired Newton. He also had a daughter. Two daughters, actually. But her half of correspondence with the eldest lives and frames this biography of Galileo as a father with responsibilities to his family as well as tells the story of his struggles with the Catholic Church. 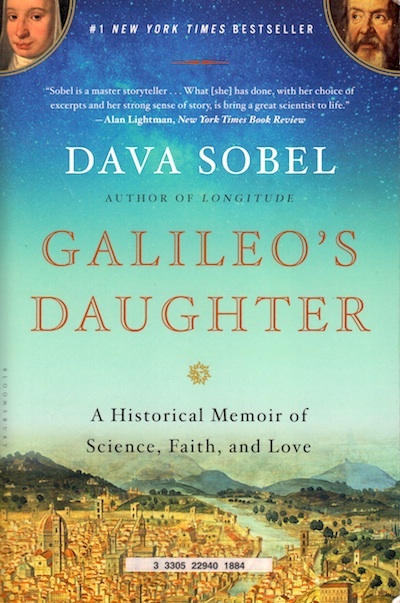 You should read Galileo’s Daughter because it humanizes the scientist and goes into detail about his conflicts with the Church. Which I only knew some of, honestly. It’s a solidly written biography of an interesting person during an interesting historical era. It also, if you choose to look at it that way, highlights the different ways men and women behaved in Reform-era Italy. Galileo was brilliant and was allowed to be kind of a cad when he was young – fathering three children without marrying their mother. He is defined by his science and the whole religion-science debate. Maria Celeste had to become a nun because her mother died and Galileo couldn’t raise her on his own. She was intelligent and hyper-competent; she clearly loved and supported her father. Today, she might have been a famous scientist. In 1600s Tuscany, she was a supportive family member and near-abbess. It’s a pity, really, that she wasn’t allowed to flourish as a scientist. I bet she’d’ve been great at it.